IMPORTANT: A lifter’s status as “unequipped” must be clearly identified on the contest scoresheet. Lifters CANNOT “cross-over” from equipped to unequipped, or from unequipped to equipped, they can only be in one division at a time in regards to records. If not so identified as unequipped, they will be assumed to be equipped. “Unequipped” is defined as normal shoes, socks, under-garments, non-supportive singlet, T-shirt, wrist-wraps, neoprene knee-sleeves and belt. All items must conform to standard IPF Rules specifications. No other items are allowed. You must have qualified within the previous 24 months from the date of the intended Provincial or National Championships. 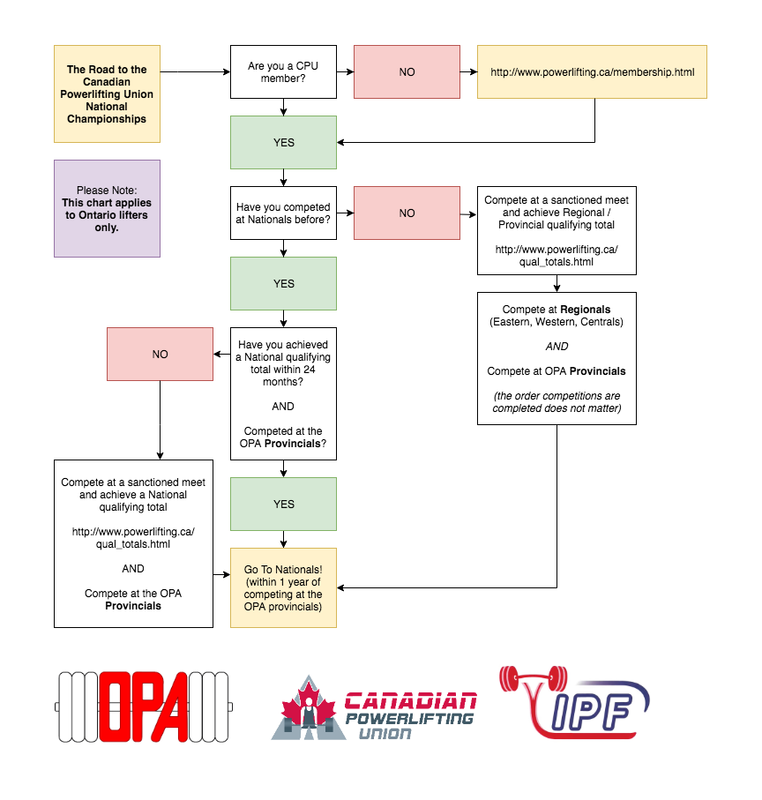 You must satisfy any Ontario additional requirements to be qualified for each Nationals. A lifter who achieves a National qualifying standard is then eligible to compete at any chosen weight class at the National Championships. For you can move up or down in weight class as long as the lifters total meets the requirements for the weight category they lift in. A lifter can qualify for a higher level meet in their next age category within the 12 month period before meeting the minimum age requirement for the class they will compete in, but cannot claim awards in that category at that qualifying meet. For example, a lifter who turns 40 next year can qualify for next years Master Nationals at any time during THIS year, but would only win “Open” awards at that meet. Bench-Only qualifying lifts can come from other Bench-Only contests or from the Bench Press portion of a regular Powerlifting contest.